Advanced anti-aging, daily moisturizer provides broad spectrum protection against sun damage and premature aging. Helps prevent collagen and elastin breakdown for firmer, more resilient skin. Improves tone and radiance. Paraben-free. 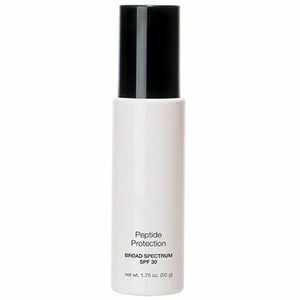 Broad Spectrum SPF protects against damage from UVA and UVB exposure. Matrixyl® Synthe’6™ Mimetic Peptide works to improve underlying skin structure, while performing the function of a “chaperone” molecule. Similar to constructing a building where a project manager coordinates the various jobs, this molecule is involved in the orderly, rapid maturation of collagen. Complexion Perfection™ is a second generation AHA, liposome encapsulated tripeptide that rejuvenates the skin by biomimetic peeling to renew smoothness. Dermal Filler Cross-linked Hyaluronic Acid helps restore volume, smoothing out skin’s microrelief. Soy Proteins are rich in essential amino acids and help increase metabolic activity for cell energy and rejuvenation. Macadamia Seed & Hazel Nut Oil & Squalane provide nourishment and moisture to the skin.